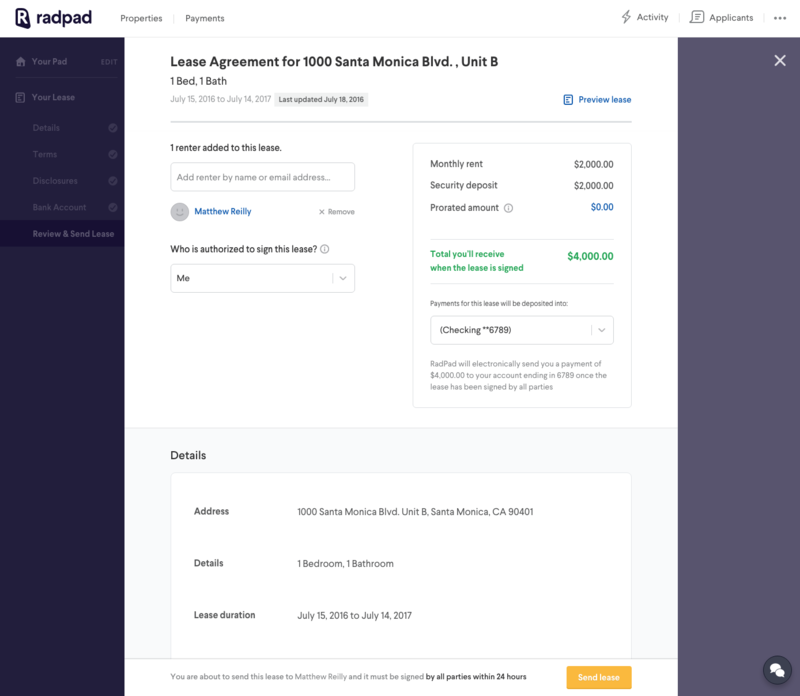 RadPad, the nation’s leading rental marketplace, today launched Lease with RadPad to simplify end-to-end apartment rental transactions for landlords and renters. In doing so, it becomes the first rental marketplace to let landlords and renters electronically execute leases. Landlords can now list apartments & homes, qualify tenant applications, sign leases, and accept debit and credit card payments without ever leaving the RadPad marketplace. Using Lease with RadPad, landlords can simply list their apartment or home rental by entering where it is located and how many bedrooms the property has. They can then price their listing with the help of RadPad, which analyzes nearby rental prices to assist landlords with pricing competitively. Landlords can also choose if they’ll allow pets and set the security deposit amount. Professional photos of their listings. Boosting listings to the top of apartment search results on RadPad. Managing active leases in the cloud. Instant notification of browsing renters for soft leads. Tracking of property engagement and driven leads via a weekly performance chart. Priority phone and email support from RadPad. 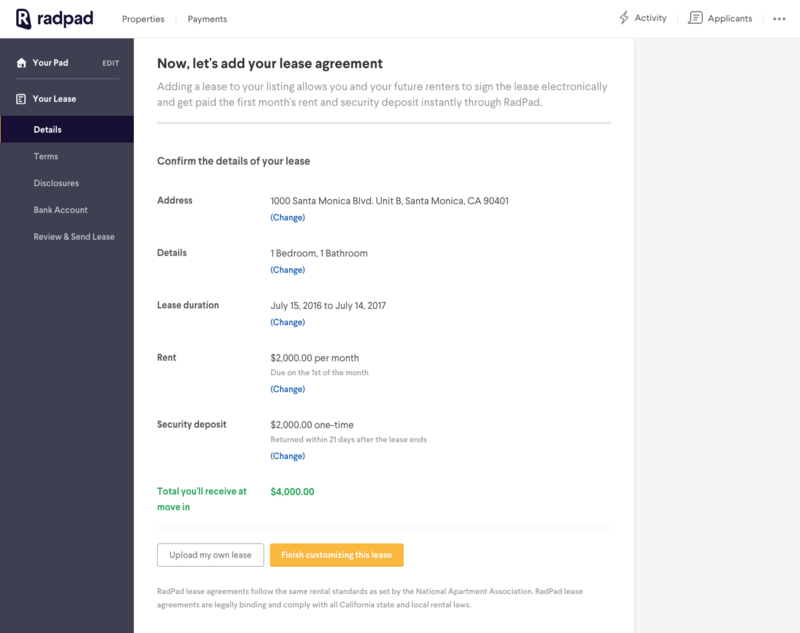 "With Lease with RadPad, I can list my properties, qualify new tenants, accept rent payments and sign leases all in one place," said Allan Arfa, a landlord with properties in Los Angeles. "I don't have to worry about tracking down late rent or where to store all my executed leases. It's all on RadPad!" Electronic lease signing is being made seamless for landlords and renters within the RadPad marketplace via DocuSign’s Application Programming Interface (https://www.docusign.com/developer-center). Using DocuSign’s industry-leading eSignature solution (https://www.docusign.com/products/electronic-signature​)​ and Digital Transaction Management (DTM) platform, landlords complete rental transactions 100% digitally. Landlords can start completing more rental transactions, faster, by listing their rental property at: http://www.onradpad.com/list. Founded in January 2013 and based in Los Angeles, California, RadPad is a rental marketplace that enables renters to find an apartment, apply, sign leases and pay their rent. It allows landlords to list apartments & homes, qualify tenant applications, sign leases, and accept debit and credit card payments without ever leaving the RadPad marketplace. The company has raised more than $14M in funding from investors that include Altpoint Ventures, Goldcrest Investments and AmplifyLA. To find an apartment, list an apartment, pay or collect rent, or sign a lease, visit http://www.onradpad.com or download the app for free on iTunes or Google Play.